It's hard to believe that it's already been two weeks since James arrived. The last fourteen days have flown by in a blur of cuddles and diaper changes. Nani and Grumpa have returned home to California (their time here after the c-section definitely made the recovery much, much easier than last time) and I've started figuring out how to do things like put the kids to bed on nights when Paul works, with minimal lifting since I'm not supposed to lift anything more than 12 lbs until six weeks have passed. It's pretty much an impossible request around here, but I try to follow it when I can. Patch loves his little brother, who he's started calling "Buddy" and each morning he gives him about a half dozen kisses before climbing up on my lap next to the little guy to relax. Maggie is fascinated with his tiny little fingers and toes and loves touching his tiny chubby cheeks while giggling. And Sadie is the one who can almost always make him stop crying. If he's crying in the car you'll hear her little voice start to sing a lullaby and suddenly the crying will stop as James listens to his sister's voice singing a made up song about loving him. She relishes being the biggest and the one who is able to hold him on the couch when some toddler related disaster inevitably comes up throughout the day and I need two free hands to come to rescue whoever it is that has gotten themselves into trouble. In other James news, we still can't decide what color hair he has. Sometimes it almost looks light brown. Other times it looks like a bright golden color. 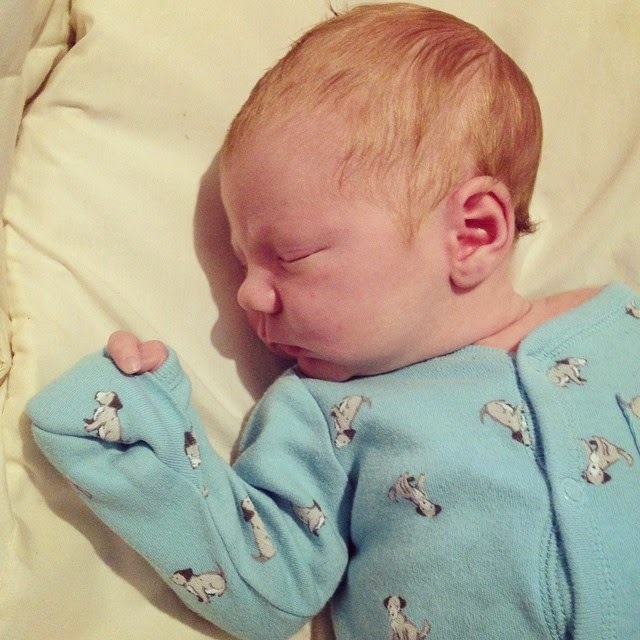 And the pediatrician said "A red headed baby!" when she walked in the room, so sometimes his hair definitely looks red. It almost always looks red in pictures, even without any editing or filters to adjust the lighting (which I almost always have to do since the lights in our house tend to be on the dim side). Now to get a jump on our first day starting back on school again. It's going to be interesting seeing how this goes... I think James is going to be spending a lot of time in the Moby wrap. He looks just like your husband in these pictures!!!!! And I love that he stops crying when Sadie sings to him. How precious! I love the stories of how well your children get together! My oldest was born with hair very similar to James, and we thought for sure she would be a redhead or at least strawberry blonde. Nope! Around 1 it made the definite transformation to blonde. Your family gets more beautiful with each addition. Congratulations on wonderful transitions. His hair is rather like one of mine, sometimes it looks red, other times blond other times more light brown. I am guessing it will be either brown or blond with strawberry highlights. At 2 1/2 we are still guessing on where our little guys hair will settle. Love all the pictures, you are so much more organized and diligent about pictures than I ever have been!